On Saturday 1 March 2014 I went to the Green Man Hwyl 2014. Christina, Des and myself have been to the Green Man Festival every year since 2011, and it was therefore logical we attended the Hwyl, held to celebrate Saint David’s Day, at the Cecil Sharp House in Camden Town. The event started at 1400, and we spent a disproportionate amount of time in the basement ‘refectory’ near the bar (! ), but also visited the outside (very) miniature recreation of the Green Man Festival. 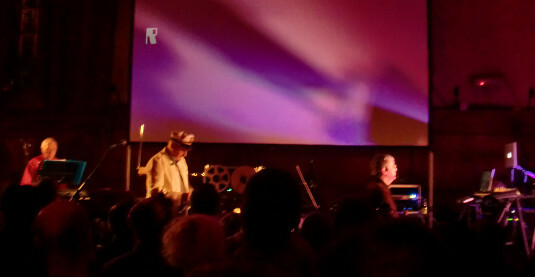 The main hall accommodated the bands – headlined by the most excellent BBC Radiophonic Workshop (pictured), consisting of members of the former BBC department that was Kraftwerk before Kraftwerk existed. @tonys Excellent. Thanks for coming, and thanks for enjoying!